This is the starting line of the Neuromancer.It shows the world looks like pesimist, dark but at the same time it related to tecnological world in all the way.TV is the most powerful weapon to control people, it’s fast it becomes a need like air it stays there at the sky, and it’s the most simple form of tecnology, the basic.The ones who control this, the pests of this world, can eat the cables and turn this world down instantly but it mean they will face with other bugs at this tunnel.Let’s know these pests of Chiba city firstly. There is another character, beautiful Molly; is similar like Trinity in some ways in the matrix trilogy. She has blades under her fingernails which she can use like claws, she is one of the main characters. Chiba City looks like a computer part at the from the sky it’s irony of this virtual world which the neurons connected directly to cyberspace. Wintermute is reveled and it’s the vital thing that the team needs to complete the mission. Turing-imposed software barriers using a powerful icebreaker program. 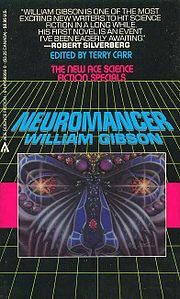 Wintermute used armitage to persuade Case and Molly to help it merge with its twin AI, Neuromancer. With this the old member of operation scream fist is come back again but killed by wintermute.Wintermute/Neuromancer contacted with them, and has begun looking for other AIs like itself. Scanning old recorded transmissions from the 1970s, the super-AI finds a lone AI transmitting from the Alpha centuiry star system.